Born in St. Louis, Louise Freedman graduated from Vassar College in 1937 with a major in creative writing and poetry. Choosing the visual arts as her primary means of expressive commentary, she began advanced studies at the Art Students League, the New School, Teachers College, Pennsylvania Academy, and the Washington University School of Fine Arts. 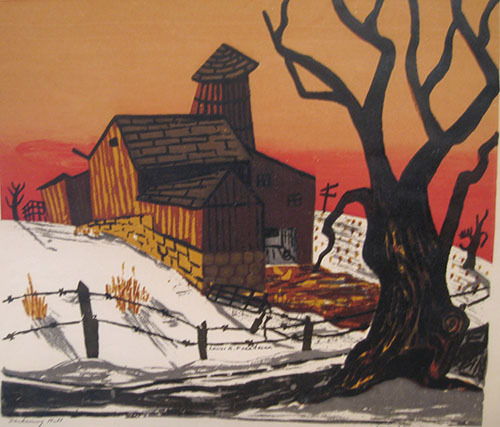 An early member of the National Serigraph Society, she explored the wide range of printmaking—serigraphy, lithography, woodblock, etching, monotypes—and exhibited her prints and paintings in more than thirty solo shows including galleries in NYC, The Hudson River Museum, and the U.S. State Department Istanbul. Her work has been shown at The Metropolitan Museum of Art, The Brooklyn Museum, St. Louis Museum, Vassar College, the Library of Congress, the Glass Gallery, NYC, and is held in public and private collections. Louise maintained a studio for 40 years in Hastings-on-Hudson, NY, where she resided with her husband, the painter Maurice Freedman. She was active in her community and as an art educator, presenting her lectures and printmaking demonstrations at venues in NYC and at colleges and museums. Freedman was an artist member of National League of American Pen Women, a life member of the Art Students League of NY, and Honorary Vice President of Sleepy Hollow Concert Association. All Images and material on this site are © Freedacres and their respective artists and may not be copied or redistributed without written consent.